Thirteen new minerals in your worlds. 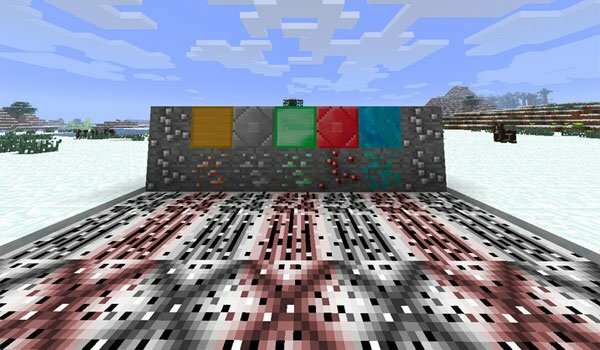 M-Ore 1.7.2 and 1.7.10 is a mod that adds up to 13 new materials by the time, that can be found in specific biomes, in the Nether and The End. These new materials are: copper, ruby​​, bronze, tin, titanium, silver, uranium, red granite, chrome, stainless steel, sapphire, platinum and meteorite. We can create new tools with stainless steel, brass, copper, copper, bronze, sapphire and ruby. While we can create new armor using ruby, bronze and titanium. All materials can be found as the mineral, except stainless steel and titanium, which should be crafted by yourself. How to install M-Ore Mod for Minecraft 1.7.2 and 1.7.10? New materials and new possibilities for the equipment of your character!